Archaeologists from the University of South Carolina just completed a 4 year long survey of Charleston, South Carolina’s Civil War naval battlefield. 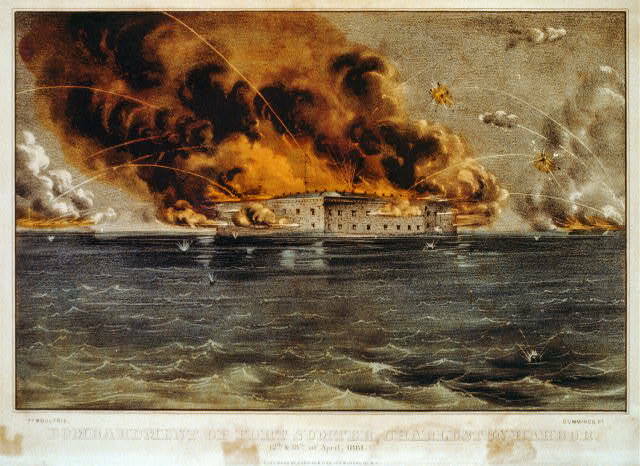 While many associate Charleston with the attack on Fort Sumter or the CSS Hunley, the city was the scene of multiple naval engagements and an important port for Confederate blockade runners. The archaeological team created a map of wrecks, gun emplacements and harbor obstructions in 2010 and has spent the last 2 years surveying some of those sites. Among the sites are the wrecks of several Union ironclads that were sunk in action with Confederate land batteries or by “torpedoes” – early versions of what are mines in today’s naval parlance. The archaeologists also sought the wrecks of the “Stone Fleets” – a fleet of approximately 30 ex-whaling ships and merchant vessels purchased by the US Navy, stripped of all valuable implements, loaded with stone and then sunk as block ships in the approach channels to Charleston Harbor. Because the ships were wooden hulled and had been stripped of most of their metal fittings, the USC team had to rely on side scan sonar, further complicating the task of locating the ships. The remains of Confederate blockade runners were also surveyed by the team, including a set of three wrecks that are now buried beneath dry land due to the shifting sands of the beach. The survey will be helpful not only to historians, but also to the US Army Corps of Engineers and other planning entities for the avoidance of wrecks and other obstructions in the harbor.